The Edwardian Era followed the Victorian Era and ranged from 1901 to 1910, though some extend this range to 1914 to cover the First World War. The Edwardian Era covered the span ruled by of Queen Victoria’s son, King Edward VII. King Edward VII came into rule while already popular for his love and respect for fashion, so it’s needless to say that this era was filled with joy, splendor and fashion – unfortunately, this time of leisure would come to a quick and wrenching stop at its end. The Edwardian Era gained the name “Belle Epoque”, which stands for The Beautiful Era – and we believe that this is partially attributed to the beauty of the jewelry of this time. The heightened popularity of metals, and in turn, the gained knowledge of metal fabrication led way to the development of platinum. Furthermore, up until the end of the Edwardian Era, Platinum was largely backed with gold. These two facts makes fraudulent Edwardian Era Jewelry relatively easy to distinguish – that is, if it’s a platinum Edwardian Era piece but it isn’t backed with gold, it most likely isn’t authentic. Jewelry during the Edwardian Era was light and delicate. Still reeling from the Victorian Era, white continued to be a favored color of the Edwardian Era. The popularity of white only intensified with the creation of platinum and the late Victorian discovery of diamond mines in South Africa – the combination of which produced spectacular platinum and diamond pieces (a combination that still reigns in popularity today!). Jewelry of the Edwardian Era was light and delicate – a popular decorative aspect on jewelry was milgraining. Milgraining used small melted portions of platinum to form tiny beads around the border of a piece to give it an additional dimension and appearance of delicacy. Many Jewelry styles from the Victorian Era flooded into the Edwardian Era. Women still had very little room to accessorize due to their layered clothing styles, so beautiful and functional brooches remained high in popularity, only this era’s brooches were platinum and diamond. Towards the end of the Edwardian Era, the style of clothing for women began to change and allowed a little more breathing space along the neckline. This change in fashion allowed for necklaces to make an appearance in the times, and though their victory was a short one that preceded World War One, their statement was one that left a lasting impact and would reinstate shortly after the war ended. Weddings in the Edwardian Era were quite similar to the weddings with which we are familiar with today. In order to be “legally recognized”, a wedding had to take place between 8:00 am and noon. Despite this, the most popular time for a couple to wed was 2:30 p.m. Upon recognizing this, the British Government began to recognize this as a legally recognizable time if a license, costing 30 pounds, was acquired by the couple getting wedded. Prior to the Edwardian Era, an engaged woman was protected by legal recourse if the nuptials were cancelled. The engagement ring started taking a form that was more than simply symbolic. Engagement rings began becoming more luxurious and expensive, and with that, substituted the need for legal recourse because the price of the ring was considered to be enough protection. There were two types of engagements, which can be considered traditional and non-traditional. Traditional Engagements were called Bann engagements, where to couple getting wed declares their intent to marry in the church and returns to the church in the parish which the husband lives in for three weeks, after which the wife must also live in the parish for a minimum of 15 days before the wedding occurs. This tradition previously pushed couples towards elopement, which during the Edwardian Era birthed the non-traditional engagement by license. In an engagement enforced by licensed, only the 15 day portion of the Bann engagement was enforced. Engagement jewelry followed the trends of the times. Popular engagement rings were platinum with diamond stones, though delicate colors gems were also well liked. The two most popular styles of engagement rings were the cluster ring and the filigree ring. The cluster ring is one in which a smaller stones are gathered together, or clustered, to create the imagine of a magnificent and big stone. 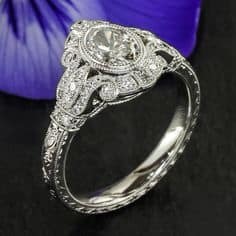 Filigree rings focus less on the stone and more on the attention to find detail on the band – the filigree rings threads thin portions of platinum to create articulate designs that reflect the fine details of lace. The Edwardian Era was a marvelous time, full of parties and drinks and vacations alike! If you want pop-culture reference, the Titanic sank during the Edwardian Era and the movie itself reflects the leisurely times of the past. But much like the Titanic, this Era reached an abrupt and tragic end – this end is represented by the beginning of the First World War.